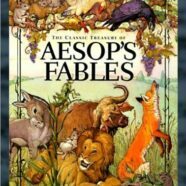 I recently bought a collection of Aesop’s Fables for a few euro somewhere. It’s got the hare and the tortoise on the cover and the tortoise, without looking behind him, seems to be able to sense the hare’s presence. His neck is outstretched and his mouth is tight; he wants to win alright and hasn’t had a rest. “I’ve worked too hard for this to let it slip from my grasp,” he appears to think. The hare is alarmed, his ears drawn back, his body stretched out, his eyes alert. He knows he’s been complacent. He thought he had it in the bag as it were. He had over-extended himself, if only in his imagination, too early in the race, oddly enough by having a sleep. Now he’s really under pressure. It’s reminiscent of another Fable, that of the Astronomer who goes about at night looking up at the stars in wonder and not looking where he’s going. Inevitably he falls down a well and a stranger appears at the top of the well and says to him, “Why, in striving to pry into heaven, do you not see what is on earth?” I thought about all the money we spend on exploration of space and on self-driving cars and Presidential dinners when there are so many more deserving causes like homing people and feeding the starving children of the world. Why are we always reaching for things that are far away and reflecting on how great we are when we manage to reach them when, within our grasp and without too much effort or ingenuity, we could help those who need help now? There’s a fable for every occasion, it seems. In that of The Hart and the Vine, a hart is chased by hunters into a vine. Concealed well, he sits there and watches as the hunters pass by then, reverting to form, starts to eat the vine; that is, after all, what harts do. But the hunters hear the rustling and turn to see the hart there exposed and shoot it with an arrow. “I am rightly served,” the hart thinks on the point of death; for I should not have maltreated the Vine that served me.” Aren’t we despoiling the very earth that nurtures us? Isn’t that the whole problem as evidenced by climate change? We don’t know when we’re winning, it would seem. They’ve changed some of these nursery rhymes and fables. Whoever “they” are have decided that these children’s stories are too violent and that telling them to kids will damage them. There’s little doubt that they’re violent. Take for instance the story of The Lion, The Wolf and The Fox. The lion is dying and the wolf comes to visit him and reminds him that the fox hasn’t bothered to come to see him. The fox arrives just as the wolf is about to finish maligning him and the lion roars in anger at his late appearance. The fox, being clever and offended, tells the lion he’s late because he’s been searching for a cure for the lion’s malady. Eager to know it, the lion demands to hear what the fox has to say. Well, says the fox, you have to skin a wolf and, still warm, wear his skin about you. So the lion flays the wolf and to the skinned wolf the fox says, “You should have moved your master not to ill will but to good will.” Keep your opinions to yourself I guess.